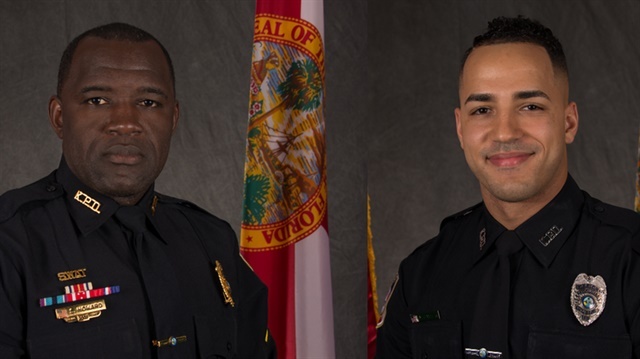 Funeral services for two Kissimmee, FL, police officers killed in the line of duty will be held Thursday, police said Monday. The services for Sgt. Richard "Sam" Howard and Officer Matthew Baxter will take place at 11 a.m. at First Baptist Orlando. The church is one of the biggest in Central Florida and can accommodate thousands of people, reports the Orlando Sentinel. The services will be open to the public, Kissimmee police spokeswoman Stacie Miller said. Both officers were shot in north Kissimmee on Palmway Street near Cypress Street Friday night. Baxter, a 27-year-old three-year veteran who is married to another Kissimmee police officer, died Friday night. Howard, 36, died Saturday afternoon at Osceola Regional Medical Center. Both men were fathers. Baxter left four young children, and Howard left one child, a teenager. "They are both wonderful men, family men. They are both very committed to the community," Kissimmee police Chief Jeff O'Dell said this weekend. "They were the epitome of what you ask for in law enforcement officers." Kissimmee city officials opened a SunTrust bank account for anyone who wants to donate to the officers' families. The account name is City of Kissimmee — Officer Matthew Baxter and Sergeant Sam Howard.